Martigny, Switzerland (4th October 2018) — Moka Studio is always upgrading its offering with new features to ensure users can benefit from the most relevant innovations. 3D animators and Mosketch® users can now download the latest release of our Early Access, available on the company’s website and on Wacom’s marketplace. On top of offering several enhancements, the newest Mosketch® release 0.17 includes a Streaming Server allowing users to connect Mosketch® with another 3D animation software. This new feature allows to send (and receive) joint values to (and from) your local network. This is useful for example when you want to animate in Mosketch®, and see the results, in real-time, in another 3D package. The production of 3D animated content is very complex. Professional 3D animators go through months, even years, of training to eventually master one preferred 3D package. While we further develop and improve our software, we wanted to ensure that users could unlock the power of sketching poses in their current working environment. We are still in Early Access phase, but our community raves about our sketching capability and we wanted to support them and provide tools that will boost their performance. — Benoît Le Callennec, CEO of Moka Studio. 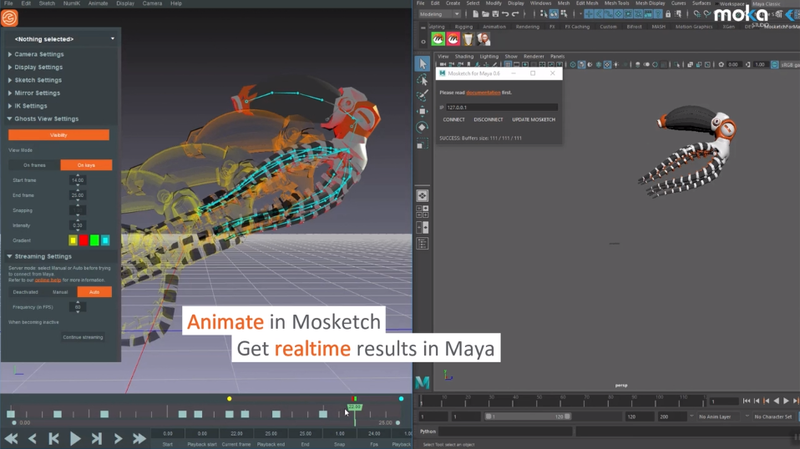 While we provide an example to connect Mosketch® to Maya® (see Note here below), the script available on download is open-source. Moka Studio invites developers to create new streaming scripts to connect Mosketch® to any other 3D animation software. Note: an example of Streaming to Maya® and documentation on how to install the script can be found here. Moka Studio is a technology startup that was founded in 2008. It develops unique technologies to make the creation of 3D animations easier, quicker and more intuitive. From 3D content creation to full VR and AR applications, from desktop solutions to cloud services, Moka Studio aims to be the reference for life-like animated 3D characters who progress and interact realistically in their dynamic environment. Mosketch® reinvents the way 3D animations are created. It by-passes the tedious and often technical process of creating so called control-rigs, which traditionally are used to animate 3D models. With Mosketch® the artist is empowered to control the full cycle of production. It is as easy as creating a 3D model, importing it in Mosketch® and starting animating by intuitively sketching poses. Mosketch® also simplifies the animations methods by providing simultaneous access to Forward and Inverse Kinematics.